I had the kernel of my idea for The Business of Performing but I hadn't built it out at all. I was spending money on infrastructure/services but had no plan for how I would generate income from the business. I wanted to outline a clear mission, business model and way forward for The Business of Performing. Greg was instrumental in helping me face my resistance and push past my creative avoidance. He helped me shape the story of my business. Who it's for. What I do. Greg Faxon truly is a champion coach. He's shown me how much more powerful it is to make a significant impact and transformation one client at a time than having a negligible effect on many. He is constantly focused on how to elevate the people he works with to heights they haven't yet imagined. With Greg as my coach I was able to expand my high level vision of what The Business of Performing will be, while simultaneously focusing on the practical 'next step' actions that attracted my first paid clients. With Greg as my champion I have moved my business from a vision to a reality. 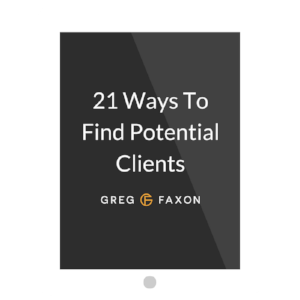 Since working with Greg, I signed my first coaching clients. The investment I proposed to them was much higher than I would have been confident to ask for before we began working together. I was able to move forward on the business idea that I'd been sitting on for 12 months. I'd recommend Greg to any entrepreneur who wants to challenge the magnitude of growth and impact their business can have. By helping people like me build a strong business that makes a real difference in the lives of my clients and community, Greg's influence is reaching far and wide. You can learn more about Matthew at thebusinessofperforming.com.